A pinched nerve is a painful experience affecting millions of Americans every year. Pinched or compressed nerves are usually a result of bone or connective tissue placing too much pressure on a nerve. This pressure causes inflammation, impeding the nerve function which our bodies interpret as pain. A pinched nerve can occur at several sites in your body. 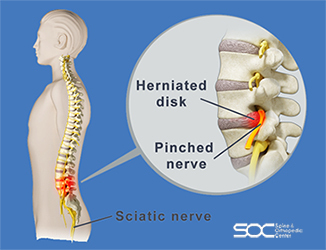 For example, a herniated disk in the lower spine, may put pressure on a nerve root, causing pain that radiates down the back of your leg. Usually, with rest and other conservative treatments, most people recover from a pinched nerve within a few days or weeks. However, surgery may be needed in some cases to relieve pain from a pinched nerve. Ask our spine specialists about all possible pinched nerve treatments and minimally invasive procedures by requesting an online appointment or calling at 888-409-8006. Offices available in Boca Raton, Deerfield Beach, Coral Springs, Plantation and Delray Beach.